Economies are going down the spout, there is enough OPEN instruction out there to start training yourselves so you can spend your income on a trampoline, a pool, some horse riding, drums or anything else that you’d have had no money for if you were PAYROLLING the professionals who are living off the one size fits all PATENTED products they are selling you. 2012 is the year to stop bleating like a sheep. Take back the power. I have empowered parents to do this since 1996. Step up to the plate. Test your own potential and be part of your own solutions. In other words, parents in the 60s and 70s created homemade individualised programs for their kids… then it became a payroll for patent junkies… take the power back… there’s enough online training there for any family to make a start for themselves…. what, you won’t do it perfectly, exactly as a highly paid professional? so what! maybe your adaptation will fit your particular child even better! 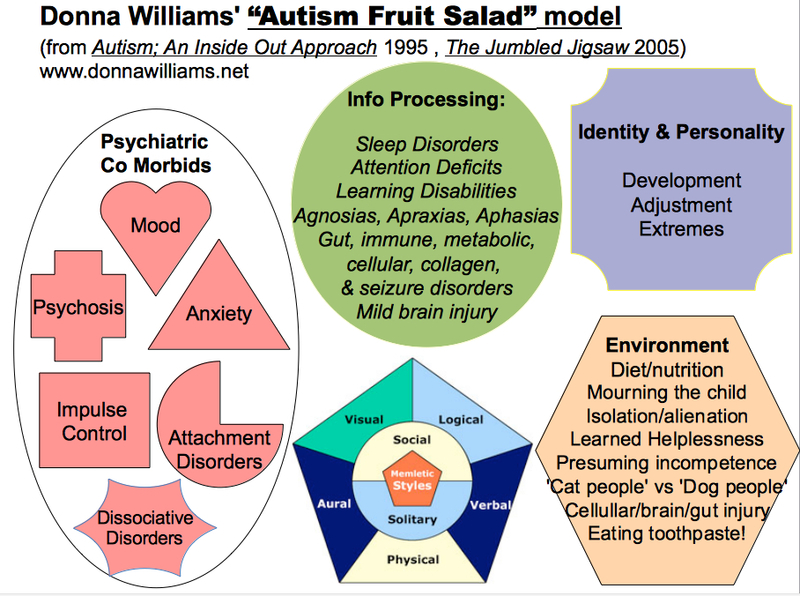 And don’t forget that autism is a ‘fruit salad’, so always ask yourself exactly which parts of your child’s autism are you trying to address? And then whether the approach you were drawn to actually addresses these things or best suits your particular child’s combo. Working as a consultant with over 1000 families of kids with autism, I’m familiar with watching a vast number of kids in varying programs and which kids tended to get the most out of which types of programs. I feel Teacch works best for kids who work best in solitude, enjoy and feel rewarded by solitude, like only intermittent social contact and prefer to be left to ‘get on with it’, are methodical, systematic, enjoy a high level of structure. I feel Option/Sonrise is primarily a bonding program so it best fits kids who main obstacle is that for whatever reason (including severe sensory processing issues) display attachment disorders. Option/Sonrise is about winning a child’s trust but also teaching families how to observe and not invade. Done well, it is a relatively indirectly confrontational approach so may reasonably fit kids with Exposure Anxiety who have compulsive avoidance, diversion, retaliation responses. These approaches are relatively indirectly confrontational approach so may reasonably fit kids with Exposure Anxiety who have compulsive avoidance, diversion, retaliation responses and those hypersensitive to the social claustrophobia of more directly confrontational compliance-based programs. Floortime/RDI both focus on using the child’s own interests and co-opting these into constructive activities rather than trying to force compliance of impose directions the child has no interest in. RDI would suit those who enjoy learning through doing and builds inherent reward into meaningful activities rather than relying on constant external rewards. This is a highly marketed, highly lucrative multi billion dollar INDUSTRY with vast offerings of jobs to new psychology graduates to earn up to $60,000 per family, per year to enter their home and take over as the expert in the home. That being the case expect that if you payroll such a service, exiting the program may not be as easy for you as entering it and you may find yourself having to argue the case for your right to make that choice. Psychologists are wonderfully useful if you have a mental illness. 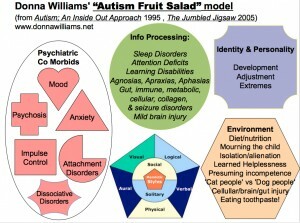 Young children can be hypersensitive to being socially pursued by directly confrontational adults seeking to justify their own pay packets and if these therapists come from a perspective of viewing autism as ‘pathology’ in need of correction through an intensive compliance based program with external rewards, then this can lead to overdoing the child’s sense of itself as a ‘case’, a therapy case. The ability to comply for external rewards is a skill that may fit with mainstream school and later employment. But applied intensively (ie up to 20 hrs per week) to a child under 3-4 years old, is in my view a precarious choice that should be weighed up with the child’s personality and equal opportunities to develop an identity broader than being an ABA ‘client’. ABA may best suit kids who are highly motivated by continuous praise and naturally strive for external rewards. These are the type of personalities which will naturally be motivated by achievement, recognition, and admiration. Temple Grandin never had ABA but had a strict nanny she felt used an ABA style approach and so is an advocate of ABA. Temple may well have had the kind of natural drives that fitted this type of program but many children with autism will not fit this personality profile. Those driven by a need for routine and acceptance may fall into a ‘pleaser role’ and be at risk of prompt dependency, learned helplessness and dependent personality disorder. Those with a high level of Exposure Anxiety or who are naturally Leisurely, Idiosyncratic, Solitary or highly Vigilant/Autonomous may be at more risk of developing progressive behavioral issues in a highly directly confrontational program like ABA. Subsequent development of acute anxiety disorders in these types of kids are not unheard of in those experiencing intensive ABA where they have experienced this as socially entrapping. The majority of ABA therapists are also female, often in their 20s and have not yet had children (nor autistic children) of their own and putting boys into intensive compliance based programs with these psychologists as their managers may have later implications for their identity development and rejection of skills they’d earlier complied with. There is no reason why a family can’t set up and operate their own ABA style program if they wish to. There is nothing highly qualified about intensively fixating on your child in a program with compliance as its basic goal and a system of external rewards in place. Parents can and have set up these programs for themselves in spite of being told by ABA therapists that they are not professional enough to do this ‘properly’ on their own. In fact families sometimes felt they ran the program better, more flexibly and more suited to their particular child. You can pay mega bucks and take a second mortgage …. or teach yourself ABA. You can also make a mixed program with an hour of three different approaches with breaks between programs or create one designed more specifically for your particular child. This is a really great and informative blog. I hope you don’t mind that I posted a link to it on one of our local facebook pages which includes parents of Aspie/Autie children. Interestingly, there was an instant response from a parent discussing why parents ‘must’ use ABA and basically justifying why it’s a ‘must’ for Autistic children. This I notice is often the response if we on the spectrum raise critiques about ABA in particular. I feel that you outline very articulately my own fears about ABA use in certain Aspie/Autie children – although far more specifically than I could manage. We notice here when we (we meaning a handful of us in NZ who do a bit of work in the AS professional world) give presentations to parents about our experiences of Autism and at times critique over zealous use of various therapies parents often react. To me, it seems at times that some parents are determined are so determined to ‘normalise’ their child that the intense use of therapies may in fact have negative effects on the childs development or future impact on their personality, sense of identity, self esteem etc. I certainly do not suggest that parents should not do their best to help teach their children skills or assist in minimising difficulties children on the spectrum experience – yet this is how any critique of therapies is received. The slightest ‘hint’ at times that perhaps certain therapies have positives AND NEGATIVE aspects to them is recieved as ‘how dare you Aspie person suggest my child should not be treated’ – AS is awful and we must ‘fix’ ‘get rid’ of it. I’m wondering if you have experienced this type of reaction from parents? And what are your thoughts about it? We wonder if at times parents are very influenced by their ‘greif’ of having a ‘disabled child’. EG, I have heard parents say things like “I did everything I could to ensure I did not have a disabled child and then I had this Autistic child’ – and often, it is these parents who willl also spend thousands trying every therapy, try every medication possible etc. I also notice when giving talks to local parents of ASpie/Autie children that some react if I suggest that ‘not everything about being on the spectrum is bad’… which I find to be true. Most adults on the spectrum, whatever their mix, do not find ‘everything’ about it bad or good. But if I suggest to parents ideas such as this, that we don’t necessarily live life feeling like our entire existance is awful or everything about having a mix of Autism things happening is all bad – I get huge reactions from some parents. When all I’m trying to protray is the idea that we are ‘human’, we are not just a label and Autism or Aspergers or whatever mix does not necessarily mean all of our experiences of life are clouded in darkness or negative experience. Yes! Yes! Yes! Thank you for this post!! I found your blog while doing research for my own little blog. I could not agree more with you! Many parents are so depleted of every resource… not just financial resources, but it is weighing on their time, energy, marriages…everything! Sometimes if we choose to invest in home-based therapies and intervention instead of wasting energy fighting for mediocre professional services, we can see amazing progress with our child and manage our own health and sanity. This is awesome. Just had a rough day arguing with my daughter’s therapy team, because I don’t want my daughter to be a puppet or forced to do tasks physically. I read your books and it gave me a new way of looking at things. Now I am getting trained on a parent-based floortime approach. Thank you. prompt dependency is disturbing and doesn’t lead to identification with the task or building of one’s own motivations except to utilise the puppetry as a further hiding place or wait until the heat is off to return to their own agenda. Far better to understand the person and become the safe haven they will develop interest in learning along side of.